I'm back to blonde! Blonder than ever actually. At the salon, I said platinum without realizing that kind meant "Make my hair translucent". Now I know how polar bears feel. This isn't even the largest size they had, so you might as well take a look the next time you're at Target. You might be able to save some money! This lovely little bag came in the mail yesterday and I couldn't be happier. I'm thinking about buying all the colors Mochi Beaucoup has! It was hard to decide which color to get, but in the end orange bag won because I need some orange in my wardrobe. They have some really cute pastels, too, that are perfect for Spring. I love how they have them stacked on top of macarons. Too cute. I like the return to blond and it looks great against the orange tee. Alas, I doubt I could get a kids size to fit although I've bought a boy's shirt or two at the thrifts. I went to TJs today, mostly because we needed frozen fruit, but partly because I wanted to see if ours had ranunculus. It didn't, but I got some lovely stocks instead (in a color I think you would appreciate-a pale rose). Do you feel like yourself again? I've definitely shopped in the girls department before- I've found that things like leggings fit better than shirts, which can be built boxier. 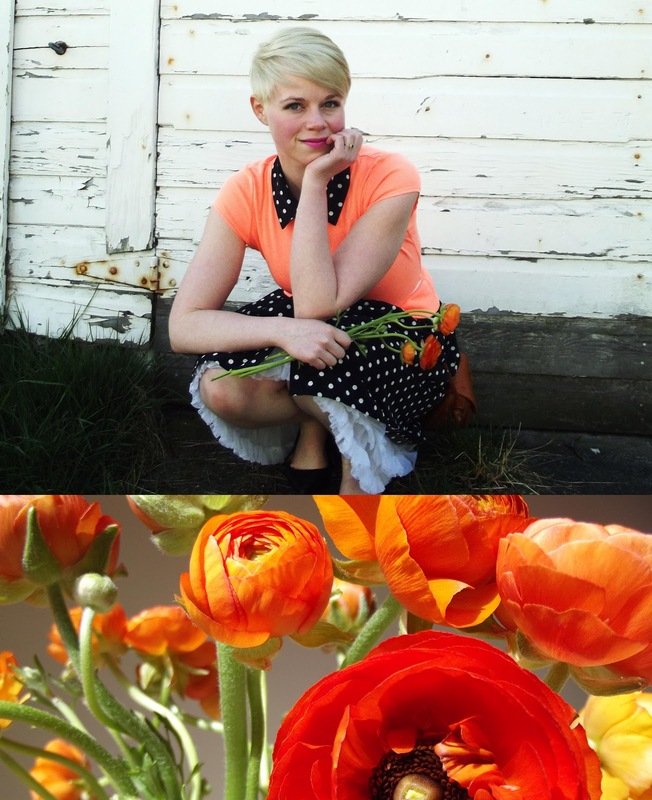 I really like that color and your ranunculus! Ranunculi? i love the blonde - i may be biased though, i was platinum for years ;) and this outfit is so super cute! i want all parts, especially the dotty dress! love! i think anyone who can pull off the platinum look totally should! you look amazing with the new hair! Awesome skirt and top! your so chic and stylist. That skirt looks so cute with the jumper. I love it! Oh yay! I prefer you blonde, and I like the platinum. I haven't tried one of your recipes yet (no time), but I do want to! Doh - I thought I wrote already but I guess I didn't. I absolutely love the blonde! It looks fantastic on you. Great meeting you oon Saturday! Your darker hair was lovely, but I have to say, I think blonde suits you best. The platinum shade is really beautiful, and it makes the coral-orange in your top seem even brighter and more vibrant somehow :) I love your little bag, and the idea that they come in macaron colours has me eriously intrigued. Must investigate! I love polar bears! You rock tow-head, amiga. I love this look. I'm obsessed with your hair!! Its amazing.